Intel has shown what it calls the “world’s first no-wires” laptop, which has wireless charging and can connect to peripherals without cables. The prototype laptop frees users from carrying a bulky power adapter, since the laptop recharges after being placed on a wireless charging table or surface. It also connects wirelessly to external displays through Wi-Di (Wireless Display) technology, which could eliminate HDMI and DisplayPort ports. The wireless display needs to support Wi-Di technology. “This is going to be the world’s first PC where you’d never need to connect a wire to it,” said Intel’s Kirk Skaugen, senior vice president and general manager for Intel’s Client Computing group. 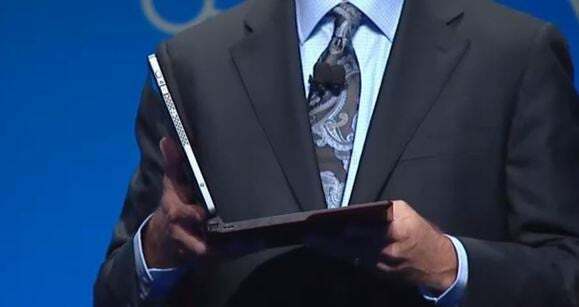 He showed the laptop during a speech this week at the Intel Developer Forum in Shenzhen, China. Intel first talked about the concept of a wire-free laptop in June last year. The laptop is only shipping to software developers looking to write applications that take advantage of the wire-free features. A number of laptop makers are supporting Intel’s vision of wire-free computers. For example, Lenovo wants to bring such features to its business laptops, Skaugen said. The laptop shown was a hybrid in which the screen could be pulled out of the keyboard dock. Intel is looking to link laptops wirelessly to peripherals like monitors and external storage through the emerging WiGig technology. At data transfer speeds of 7G bps (bits per second), WiGig is much faster than Wi-Fi. The wire-free prototype is also the first laptop based on Intel’s upcoming sixth-generation processor code-named Skylake, Skaugen said. PCs based on Skylake will start shipping in the second quarter this year, though it isn’t clear when laptops will start getting wireless charging and other features. Intel’s wire-free PC isn’t practical today as wireless peripherals aren’t available and wireless charging surfaces for laptops haven’t been installed in restaurants, cafes and other spaces. Intel is talking to airlines, airports, restaurants and other institutions to provide wireless charging stations. It could be years before wireless monitors and external storage devices are widely available. Another goal of the wire-free PC is to make computing convenient. For example, it will eliminate the need to remember passwords, Skaugen said. That points to the wire-free laptop supporting biometric authentication. Microsoft’s Windows 10 will support biometric login through a feature called Windows Hello.